Christchurch residents are beginning to fear that if Wellington continues to have earthquakes, Campbell Live might start paying them less attention. Following Wellington’s experience of a 5.7-magnitude earthquake this morning, Christchurch has demanded that the capital cease feeling the effects of any further seismic events for fear that it will steal all its sympathy. The demand came in a handwritten letter signed “Christchurch”, which was received at lunchtime at the Embassy Theatre, the seat of all power in Wellington City. But Wellington mayor Celia Wade-Brown says that it is in fact Christchurch that has stolen Wellington’s earthquake crown. 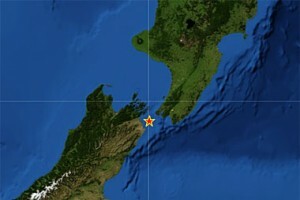 The earthquake, centred in Cook Strait, caused no real damage, but created mass panic in newsrooms as reporters fought desperately for stories about items falling off shelves. The shaking caused one barista’s dreadlocks to unravel, and a tsunami warning was issued for the bucket fountain. Te Papa’s earthquake simulator was shut down for a short period in deference to the city’s victims, but has since reopened and is reported to be as underwhelming as ever. Christchurch mayor Bob Parker was unavailable for comment, having given up.